The sales have been thin for a few weeks. Not a lot of anything great but I've managed to find a few fun things. 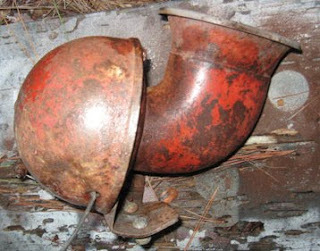 The item above is an old car horn. Sprayed with a coat of clear laquer and the red color just popped out. Above, I'm not sure what these 2 things are. Some sort of rusty sink or car part. Each one has a pipe coming out of it below. The basins are about 10x6x5 each. Can't wait to figure out what to do with them. I'm thinking about outside planters in my junk yard. Below: Now this is a first for me. I saw these when I was driving by this old house, they were stacked on the side, like trash. I decided to step out of my comfort zone and knock on the door. The guy was very willing to sell them to me and at a fair price. The hard part about these things is getting the numbers and signs off. These screws are pretty well rusted stiff, so I may just sell them as-is with all the numbers etc. Any offers????? I loved all your suggestions, but for now I've just got it out in my junk yard. I really need to trim that bush so it can be seen. Boy am I beat, Now I have to unload my car and trailer. I moved in lots of new product, and refreshed some of the older stuff. I got it, now what???? 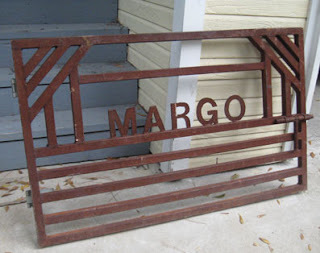 A dealer friend of mine called me and said that she wanted to give me first shot at this iron gate. Of course I scooped it up as fast as I could. Now my question is....What to do with it. It's really heavy, DH suggests we don't hang it on a wall. It would be a neat headboard, but I don't need a headboard. It could be a pot rack, but I don't want a pot rack. This has to be something for ME, not for sale. For now it sits in my barn, making me smile. Any ideas? It's about 4' x 2.5'. 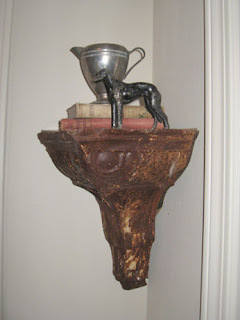 This shelf is made from an old corner piece from a tin ceiling. First I sealed the rust with a spray on varnish. This project is great if you have a naked corner, that is small like the one I have in my foyer, as seen above. Our Little Corner. After this weekend, you can find me in the Yellow Building, just across from the check out. I'm bringing lots and lots of new inventory, and the booth will have a completely different look. Can't wait to share pictures. And if you are in the mood to travel, The Junk Bonanza in September, I'll be there! You'll be sure to find wonderful treasures at each of these shopping spots. Our Little Corner in Noonday (just outside of Tyler) now has a blog. We will be using the blog to communicate sales, and events with customers, as well as introduce you to dealers and new products being brought in. Be sure to add Our Little Corner to your side bar and become a follower so you'll know when updates are made. Stay tuned for info on a great sale coming up real soon. Our Little Corner has over 6,000 sq feet of heated and cooled shopping. Located at 16706 CR 196- Noonday TX 75703. From loop 323 (in Tyler) go South on Hwy 155 aprox 7 miles, turn right on Big Eddy Rd and then a quick Right on CR 196 directly behind the Blue Store/Chevron station. Adjacent to Noonday City Hall. Open M-Sat 11-5 and Sun 1-5. When I started this blog I had a goal of sharing my "junking adventures". Although this is not exactly and "adventure" is is a story to share. I went to a garage sale on Thursday. This lady was not quite ready for us, and was still putting things outside. 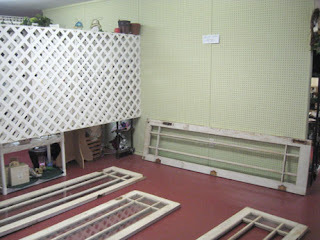 She said we were free to look around inside (storage shed) but that not everything was for sale. I inquired about an old little sterilizer cabinet that was on a shelf. She said it was not for sale. It was the perfect shad of weathered robin-egg blue, with a great label "Sterilizer" on the front, and chippy shelves inside. On Sunday evening, I was sitting down preparing a blog post about my find, at that exact moment my cel phone rang. When I answered, a voice on the phone explained that I had been to her sale and bought something that should not have been sold. I had to ask her to remind me which item, and she told me it was the little green cabinet. She explained how it had belonged to her father and was to go to her grandson. Of course I made arrangements to get it back to her and she'll be picking it up from me on Monday. I am sad to see this treasure go away, as I was looking forward to how I'd be using it. But I guess it's an heirloom and feel bad for causing her any worry. That is my little junking story for this week. I guess after years of this one would have quite a few interesting stories to tell. If you know me, then you know that I love to be organized. It must be genetic, as my Mom is a "neat nick" too. This idea came strait out of the current issue of Where Women Create. Currently available on news stands. I'm going to be using this in my booth for all the "little things" I sell. The bottles lift right off with a built in hook. I had to stabilize each slat so they don't move freely. Then I dipped into my stash of spice bottles, wrapped wire around the rims, and fashioned a hook. Then you just hook them on the slats as desired. Easy to remove and replace. Above: Love this old leather tool belt tool holder thing. I just screwed it to the crates, and it's a great place for my pliers etc. Lots of little divided drawers and the crates are great for gaining height storage. 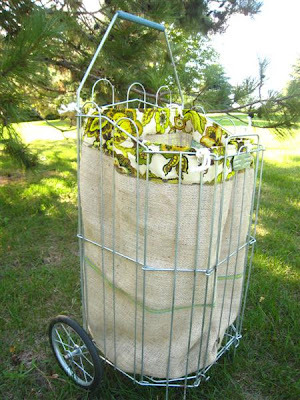 Below: I made this a few years ago out of locker baskets. I hope you've enjoyed this trip of me creating my new creative space. I hope that lots of fun creations will flow out of this space for me to share. Tomorrow I'll share the first one. Ki and Matthew have got their blog going for the new magazine. The blog will have great behind the scenes info, as well as some projects to tide-us-over. Lots of information about the folks who are working on it, and fun stories along the journey. How often do you get to watch a magazine being made? Never! Well this one is different. You'll feel like you are a part of it by keeping an eye on the blog. Be sure to hop over and leave a comment too. Also be sure to add the button if you want, and they will add you to their blog roll. Just click the BlogRoll link at the top of the page, for all the info. 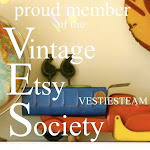 Jodi's new blog for the Gresham Barn Sale. Jodi has been working to learn how to blog and she's getting it done. So pop over, give her some encouragement, and see what she's up to for the next sale. Couch may be ugly, but it folds out as a bed, and has been very useful for guests. May purchase slip cover in the near future. This room is not used as much anymore, because I have a better guest room downstairs. This is great for kids, or extra teens when they visit though. This room has no closet, so the wardrobe is necessary. Now it's stores more than my wedding dress. Jodi has been working to learn how to blog and she's getting it. So pop over, give her some encouragement, and see what she's up to for the next sale. Goal #1, Keep Sewing machine, out and ready for use at all times. Goal #2, Plenty of space to spread out. Love this old wooden folding table I found. Folds up the size of a card table. using a corner of a mostly unused guest room, not the one I recently decorated and showed here, but a different room, up-stairs. I'll be sharing this project step by step during the next week.